Taipei is a pretty small city, and yet so many interesting stores are crammed in its limited space! What I love about weekends is that I’m able to hop into a bus and go on an adventure of exploring new cafe and stores. 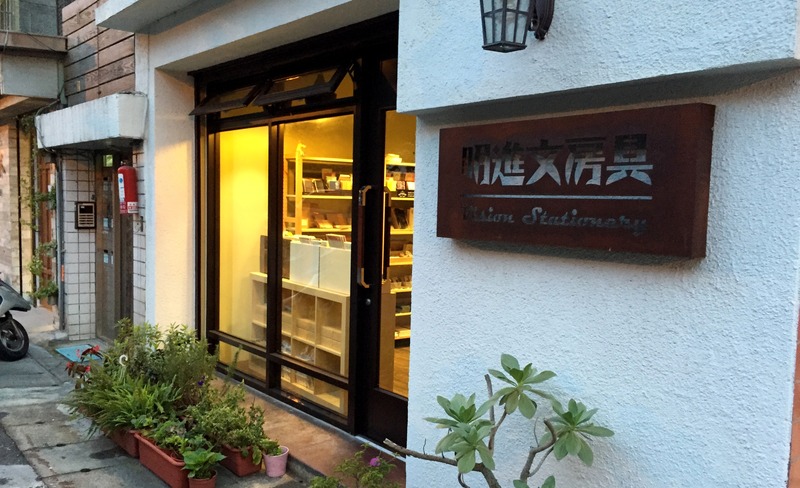 A friend’s recommendation brought me to Vision Stationery 明進文房具. Vision Stationery is tucked in a small alley near MRT Liuzhangli Station 捷運六張犛站. The brassy sign is next to the brightly lit glass wall of the shop itself. The warm yellow light is very inviting to stationery addicts like us. The owner, Mr. Chen, is a stationery addict himself. He is very selective about his products, and he took the effort to try out all the items he sells before putting it on the shelf. He is very particular about paper items and notebooks, because he believe that good quality paper and system can help people achieve great things. Behind the small cashier is a small stack of recent notebooks that he is test writing before he starts selling them. Stationery addiction’s a national trend. Not only are illustrators designing new products and producing washi tape from their artworks, we can see new stationery boutiques popping up all over the place. Some are nestled within local cafes, some are sold in wholesale stores, and some are hidden in such secretive places that only the stationery addicts know where to go. For the stationery lovers out there that would like to check out the stationery scene in Taipei, I will make a brief guide to the kinds of stationery stores that you can find here! Entering these large stationery stores is like going into candy land for stationery fanatics. The selection is large and varied. From pens to folders and from washi to art supplies, there are too much to choose from, and at very cheap prices too. Jieu Da Stationery & Guang Nan are stationery stores that are the favourites among students, because of their relatively affordable prices of all kinds of pen and paper tools for student use and normal office supplies. Jieu Da offers membership cards and you can buy things at up to 20% off normal market prices. Guang Nan offers similar selection of stationery at already discounted prices. Stepping Stone & Kingstone bookstores have a whole floor dedicated to stationery supplies, and they have more authentic Taiwanese designer stationery in stock. The best location to browse through all four of these stores are at Taipei Main Station. Another three Bookstore/Stationery Stores are San Ming, Eslite, and Kinokuniya. San Ming Bookstore carries more stationery items that are from Taiwanese wholesale stationery companies, including designer’s washi such as Kikisui and Chuyo. Eslite goes for a more modern look and features imported stationery items at higher prices. Its bookstore are beautifully designed and is great place to while away the day. Kinokuniya offers more Japanese oriented stationery items such as Midori Traveler’s Notebook items and fabric pouches. If you are visiting the Kinokuniya at Breeze Center, make sure to check out Tokyu Hands just a few floors above to see more Japanese stationery items! These boutique stationery stores offers more selected items, and their owners are all stationery addicts as well. The items that they chose from Japan, Europe, or even locally designed are very tasteful and beautiful. The environment is very quiet and homey, and all the stationery items are laid out like pieces of art. Tools to Liveby is a local favourite because they designed many stationery items themselves. Their most favoured items are the beautiful scissors and gold and silver midori clips. Vision Stationery has a very friendly owner who lives to provide quality paper that are fit for fountain pen. He offers a variety of Midori Traveler’s Notebook items as well (usually at the most valued price in Taipei). 1 over 1 Workshop is easy to overlook if you don’t follow the address, because it is within a neighbourhood apartment and you actually have to be buzzed up through the door bell to enter. A unique feature of this workshop is that they have a table dedicated for you to test out their planners and journals and many pens you can use to test-write. Hsiao Pin Ya Ji is the place to go if you are a fountain pen lover, where they offer a variety of selection from beginner’s to more expensive brands. It’s actually the friendly customers there that would often pat you on the shoulder and give you recommendation on what to buy. I’ve yet to visit Plain Stationery but it’s also on my bucket list~ Pinmo Liang Han Paper Lab is also an interesting stationery boutique to visit. Their feature products are handmade notebooks and paper products!